Green is by far, my favorite color. I love all shades of green so it was very easy for me to sit down this morning and pull out my green scrap bin to make my RSC16 projects for the month of May. 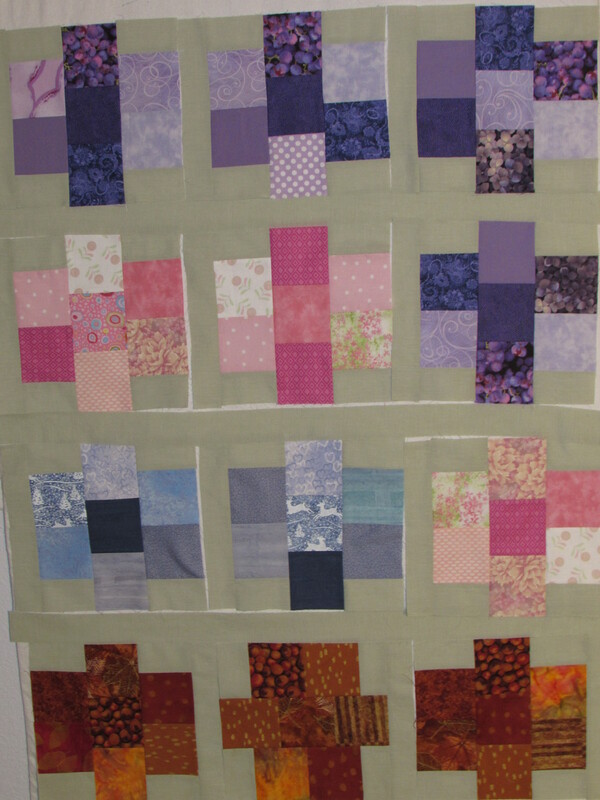 I decided to make my blocks for the Gemstones quilt first. 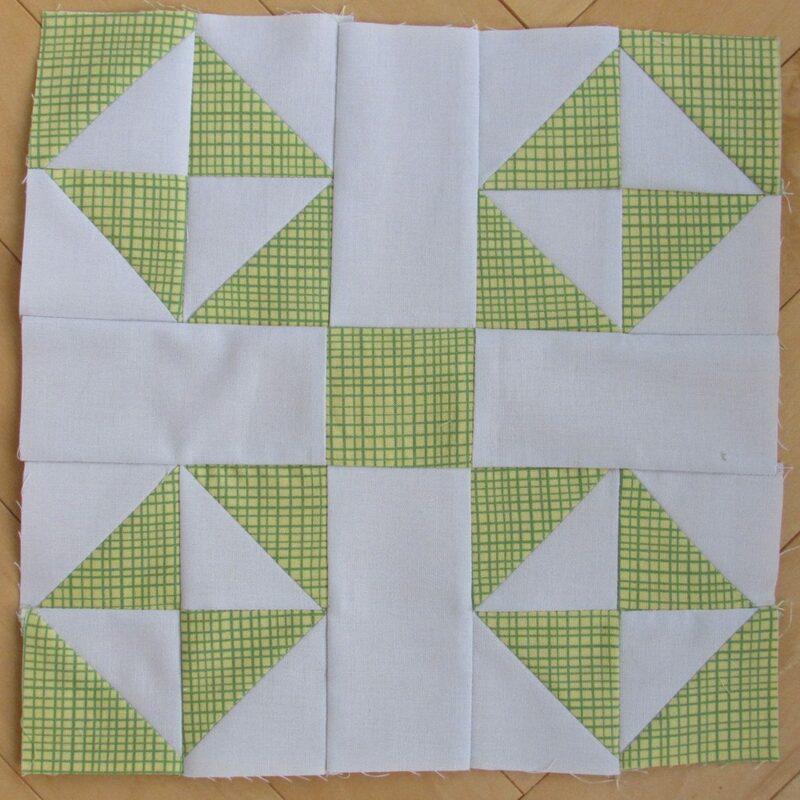 You might remember that this pattern was designed by Cynthia over at Quilting is More Fun Than Housework. 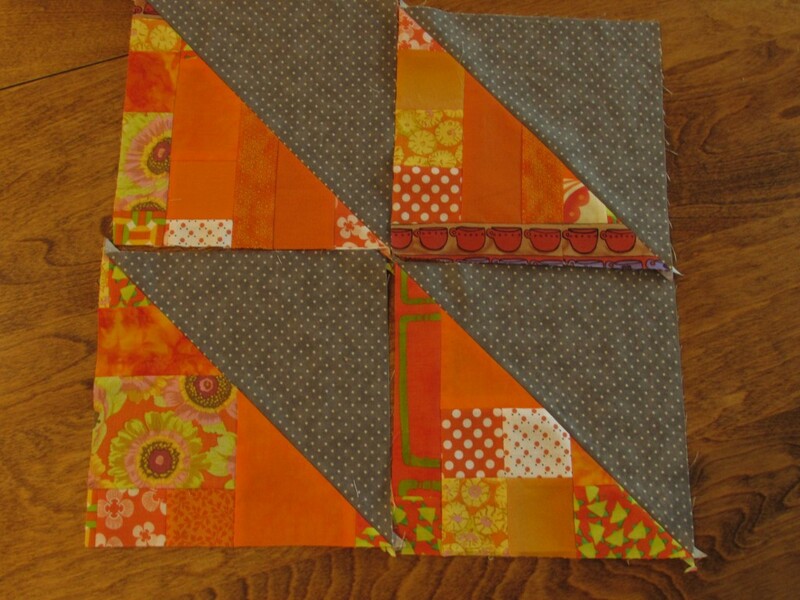 I’m not sure why, but I hadn’t thought to chain piece these blocks before. This morning I had a revelation though and zipped through the blocks in no time at all. 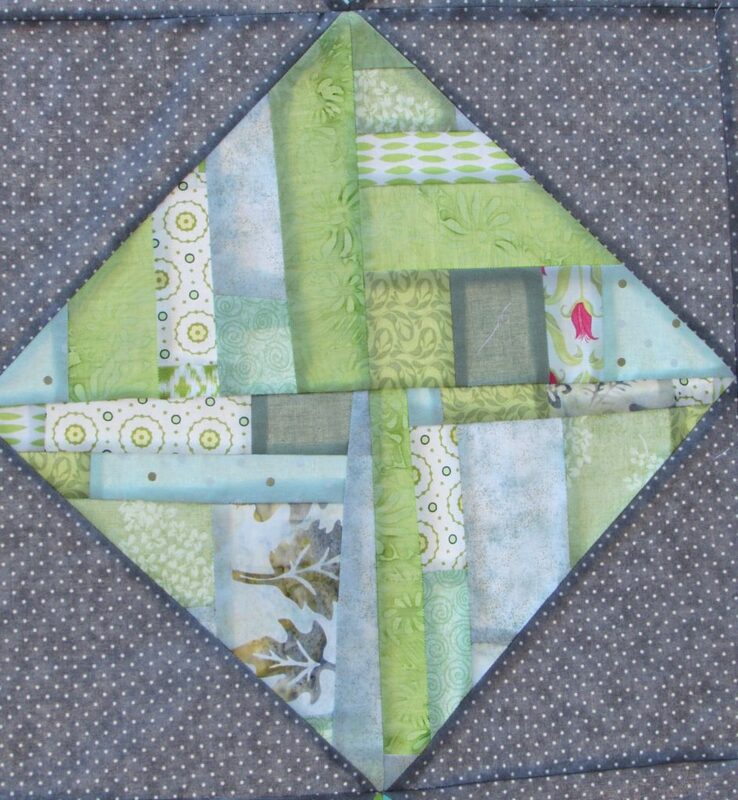 Love the emerald tones in these blocks. I wanted to use only greens that evoked an emerald gemstone so my options were a bit limited. They look so pretty though! 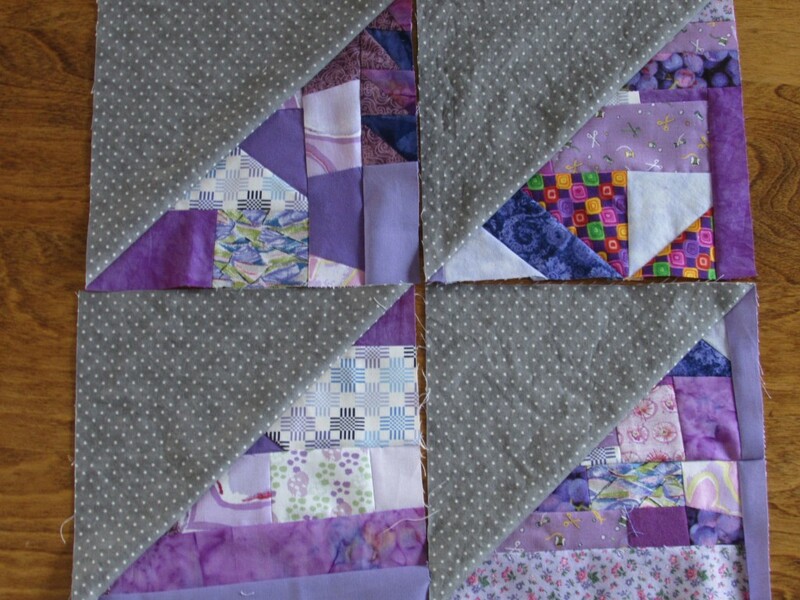 When I was taking photos (which is becoming a challenge as the blocks stack up) I noticed that I stitched the sashing to the wrong edge of these blocks. I will have to rip those seams and fix that. 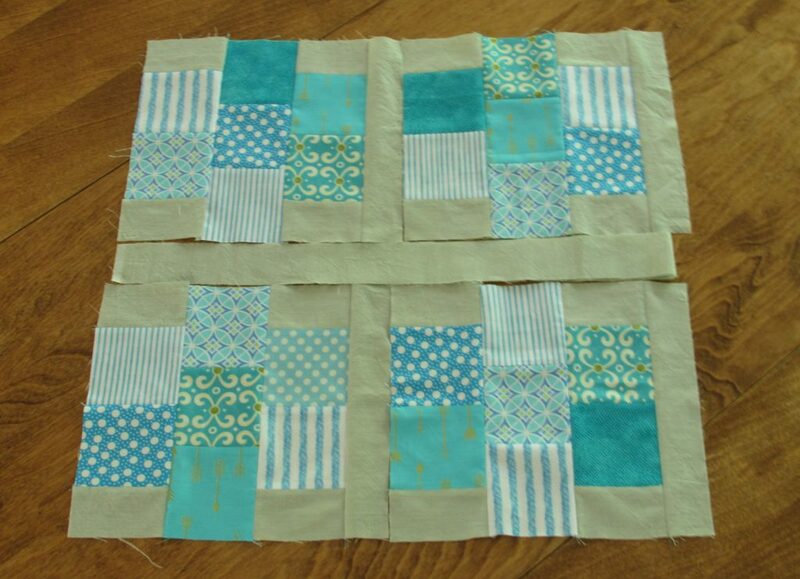 Next I moved on to my scrappy blocks that were inspired by Victoria Findlay-Wolfe’s book, 15 Minutes of Play. These blocks are so satisfying. It is playful and freeing to make these because there is really no right or wrong. 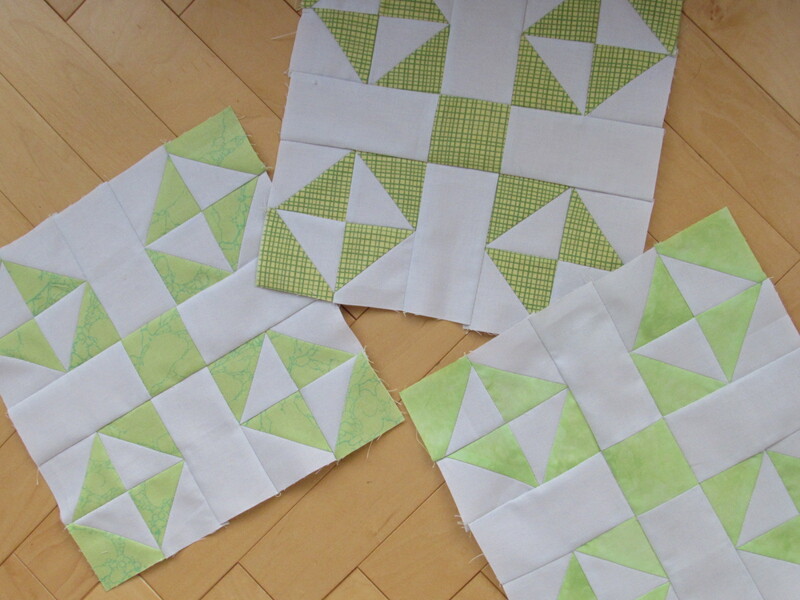 I branched out and used different shades of green for these, reaching for whichever scrap seemed to fit. 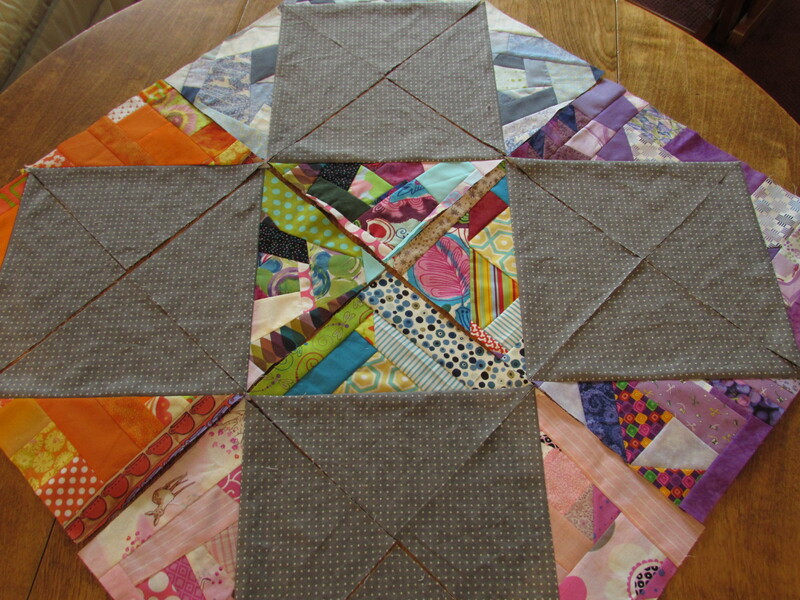 Now that these scrappy blocks are accumulating, it is fun to play with the HST layout. Endless possiblities. 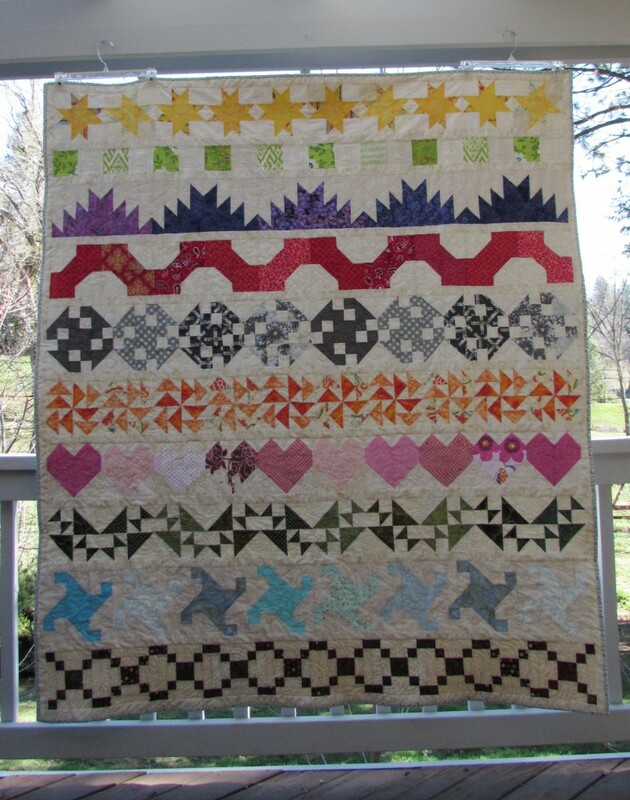 The scrappy HST’s remind me of crazy quilts. 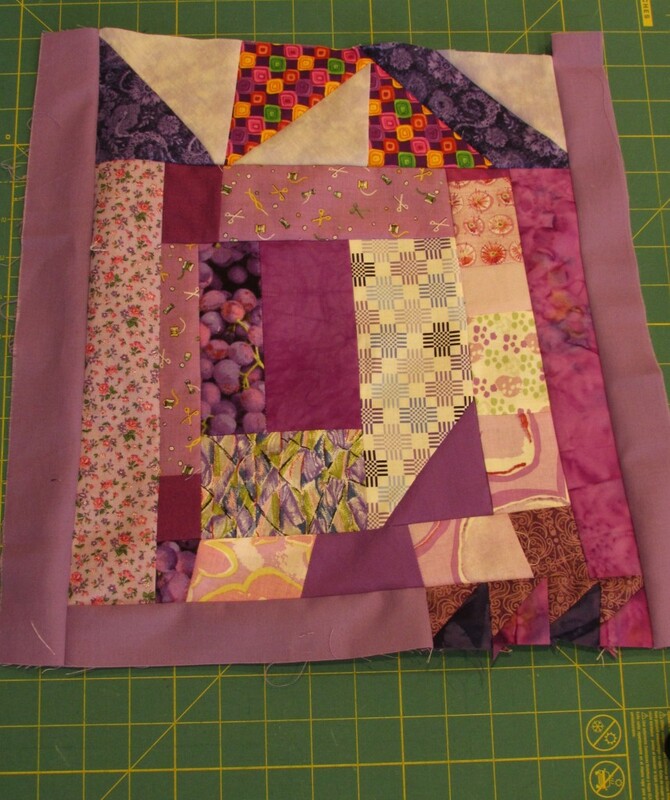 I am playing around with adding some random stitching to the scrappy side of the HST to give it more of the crazy quilt look. What do you think? I did a few zig zag seams on two of the HST’s. 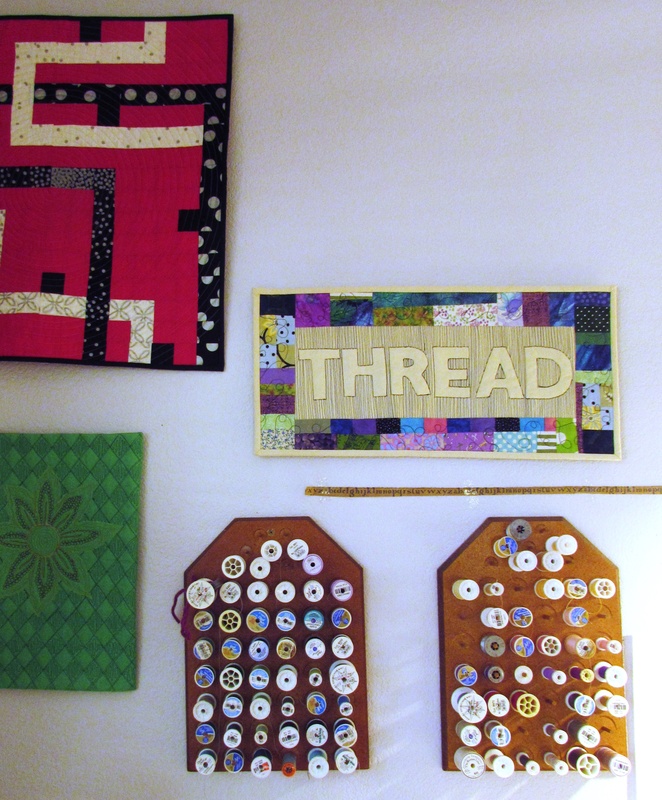 I could also do a blanket stitch which would be characteristic of those quilts. Also, if I do this, maybe I should use some Sulky Rayon threads so that there would be that great sheen Sulky has as well as add more body to the stitching. Opinions please? 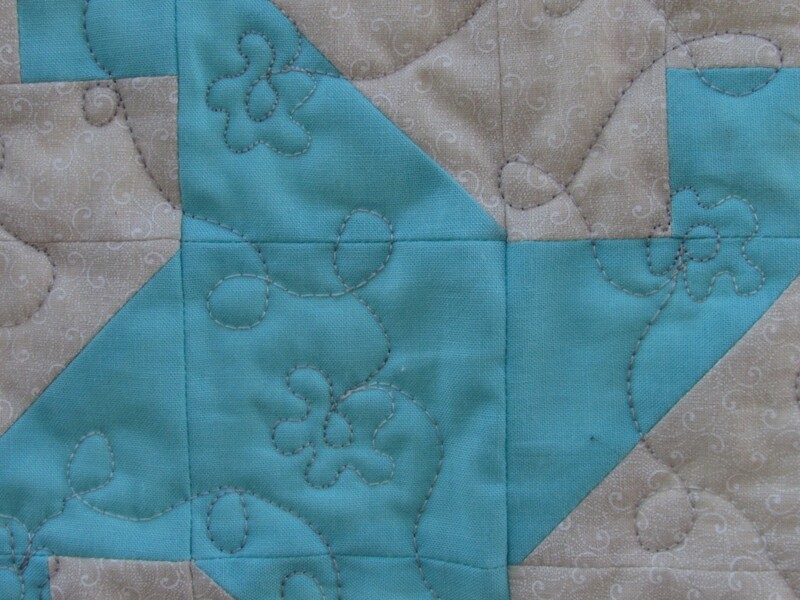 Finally… should I do these little stitches now or when I actually quilt it? 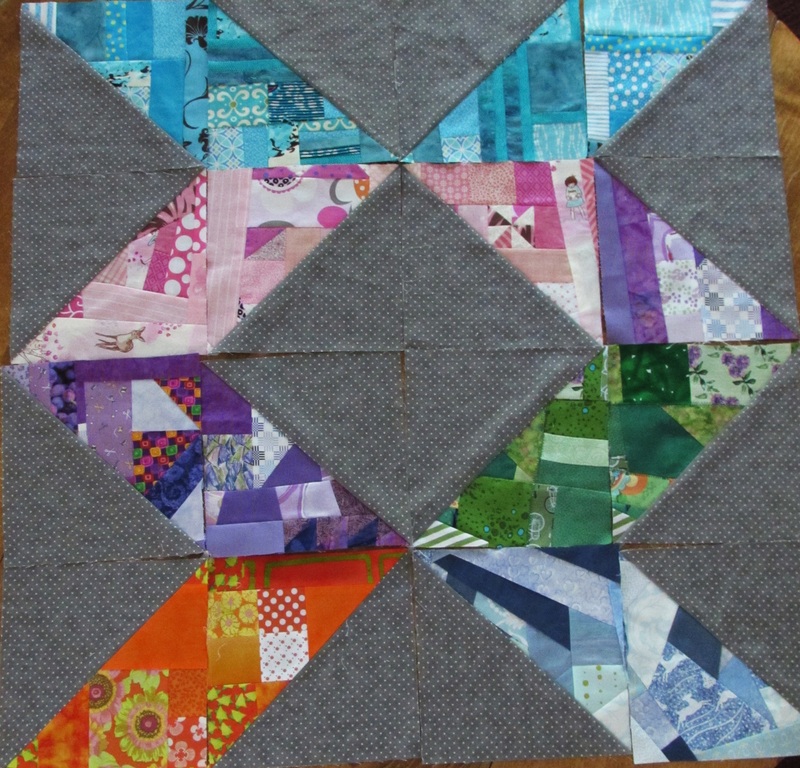 If I do it now, I will have to figure out how to quilt it such that it doesn’t interfere. 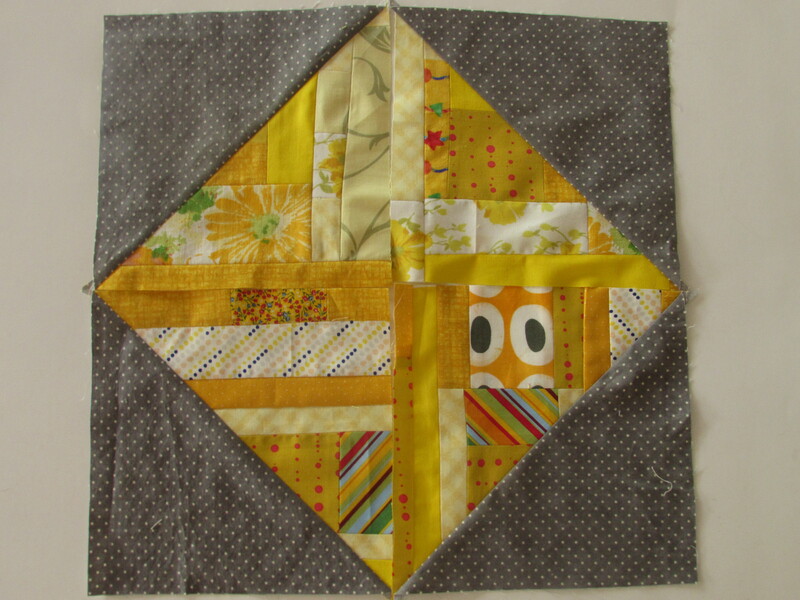 I could focus the quilting on the polkadot side of the HST’s. Decisions, decisions, decisions! Glad to have my scrappy green projects checked off the list for this month! Though I must say, it didn’t make the slightest dent in my green scrap bin. Not one little bit. Linking to my favorites. Check them out at the top of the page, under Link Ups! 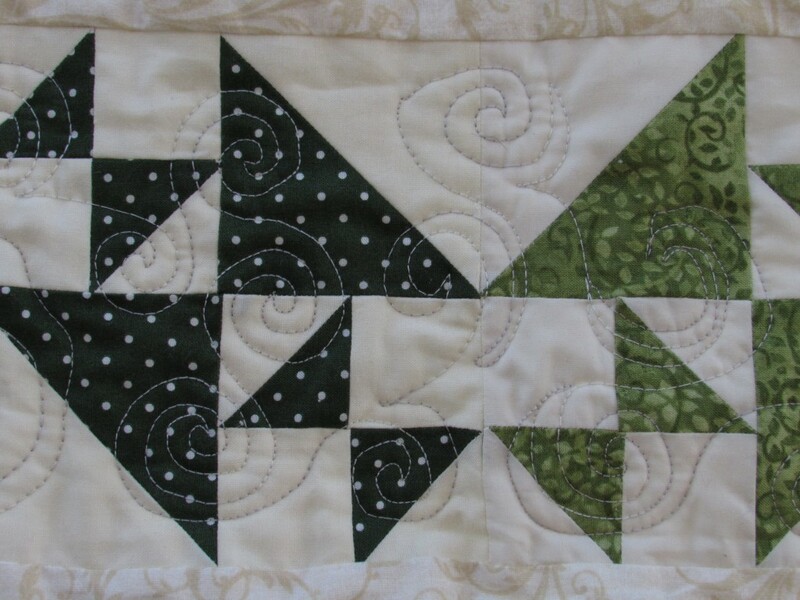 This entry was posted in RSC Challenge, Scrappy Quilting and tagged 15 minutes of play, pretty gemstones, Scrappy HSTs, Scrappy Quilting on May 18, 2016 by Bernie. 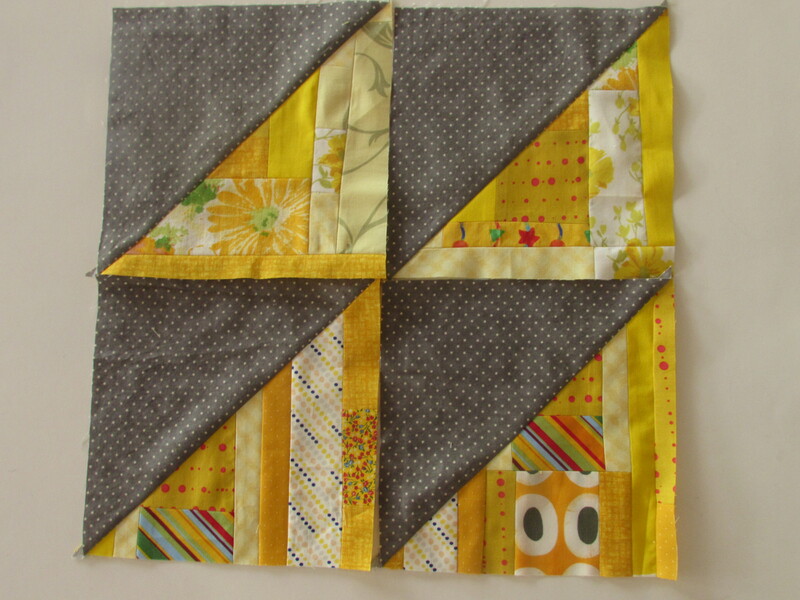 I have finished up my monthly scrap challenge projects. April was declared as the orange month. Angela, of So Scrappy, suggested including accents of black; like a Monarch butterfly. While this is a nice idea, it didn’t work for any of my projects. Plus, orange and black makes me think of Halloween, which just doesn’t feel right in April. I made my improv HST’s and I love them! 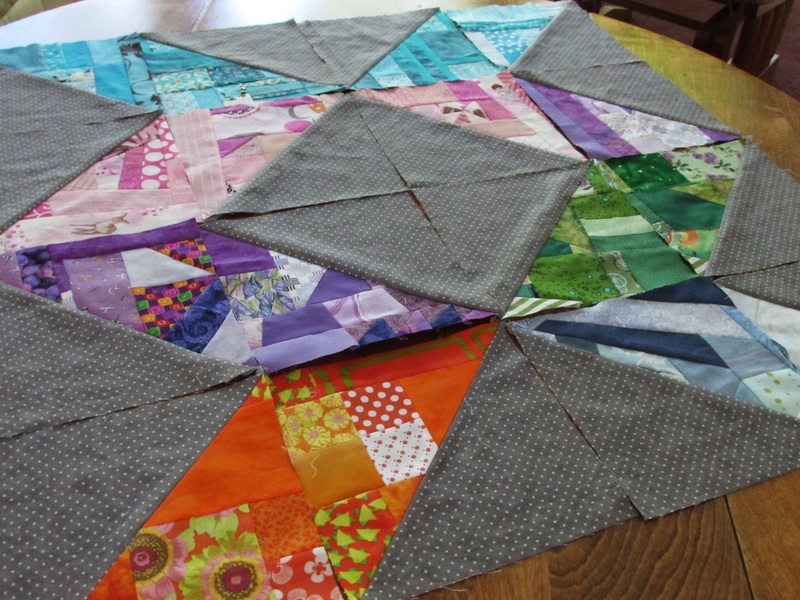 I am totally enjoying the process of piecing all of these scraps together and slicing them right back up again into half square triangles. I have the HST’s sized at 9 inches right now. Half square triangles can be arranged in an endless number of ways. Each arrangement brings an entirely different look to the project. Just changing the perspective on this arrangement (setting the blocks on point) changes the look. 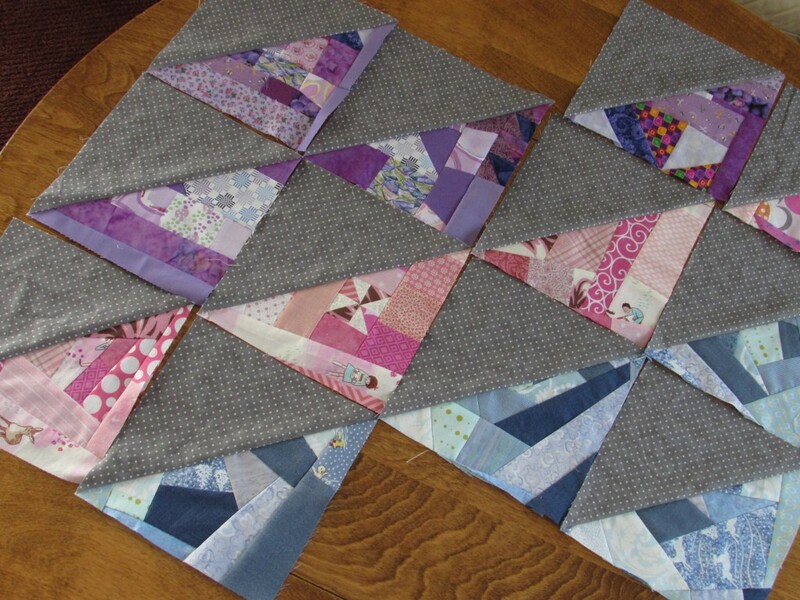 All of those gray dotted blocks would provide great negative space to quilt! 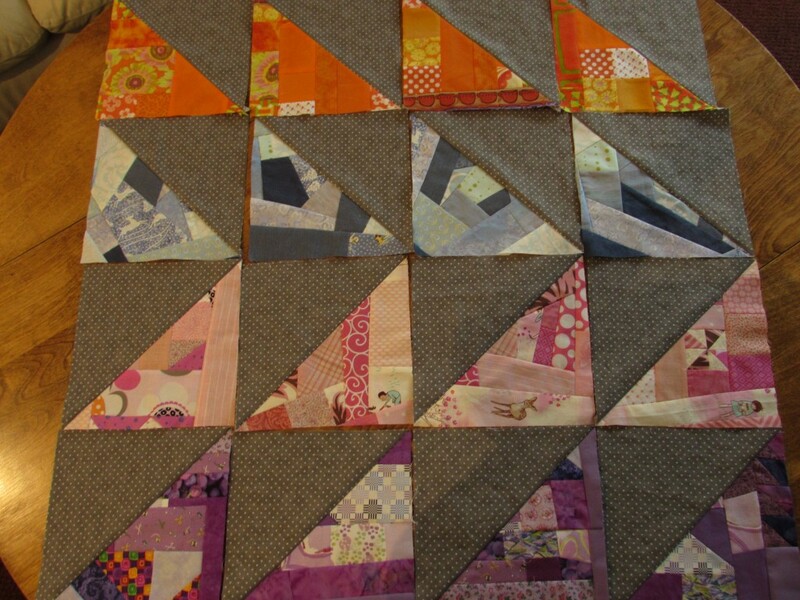 Even with all of these choices, I am debating cutting them again to make quarter square triangles. 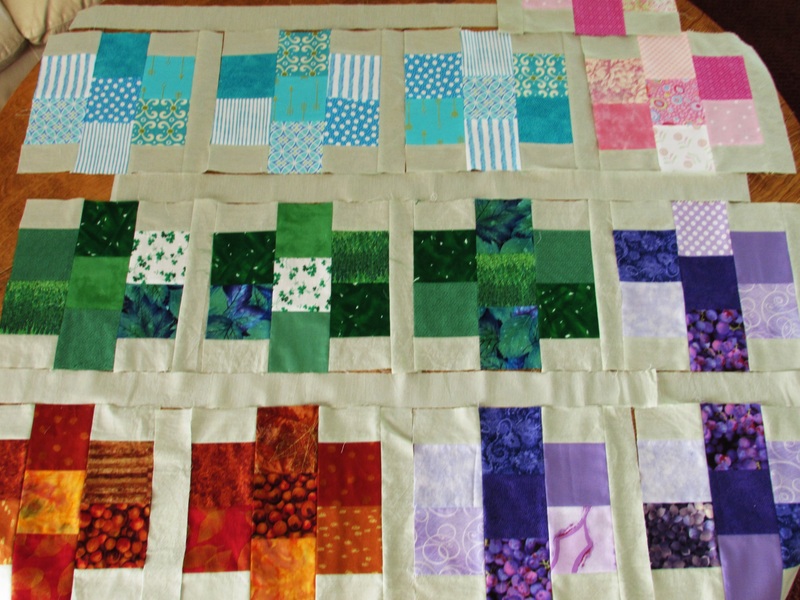 I haven’t decided yet but I think I may want to have the blocks a bit smaller than nine inches. With quarter scale triangles, I could do an hourglass pattern or a ribbon pattern (some call it a DNA quilt pattern.) So many ways to do this! I will wait until I get a few more months done and then maybe it will make itself known to me, as these things often do. 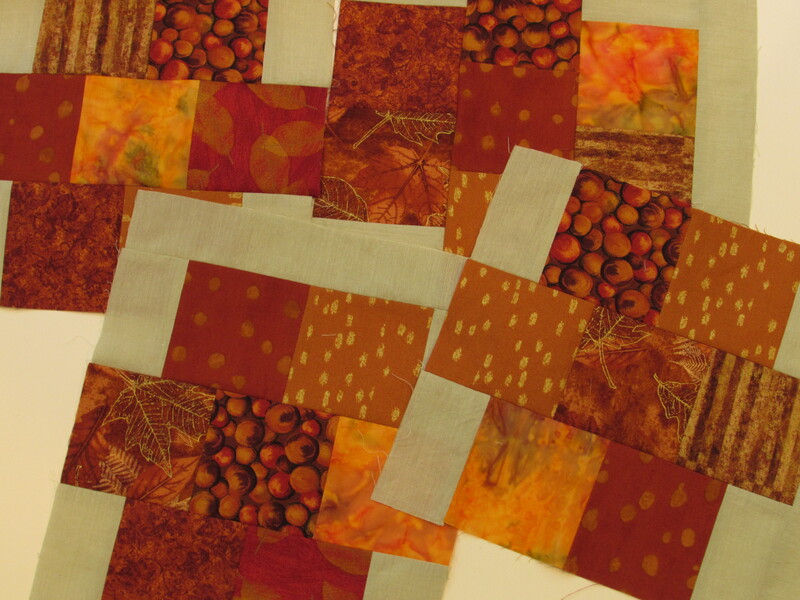 For the Gemstones quilt, I took a suggestion from Cynthia Brunz and used rust colors instead of brighter orange tones. The suggestion was absolute genius. 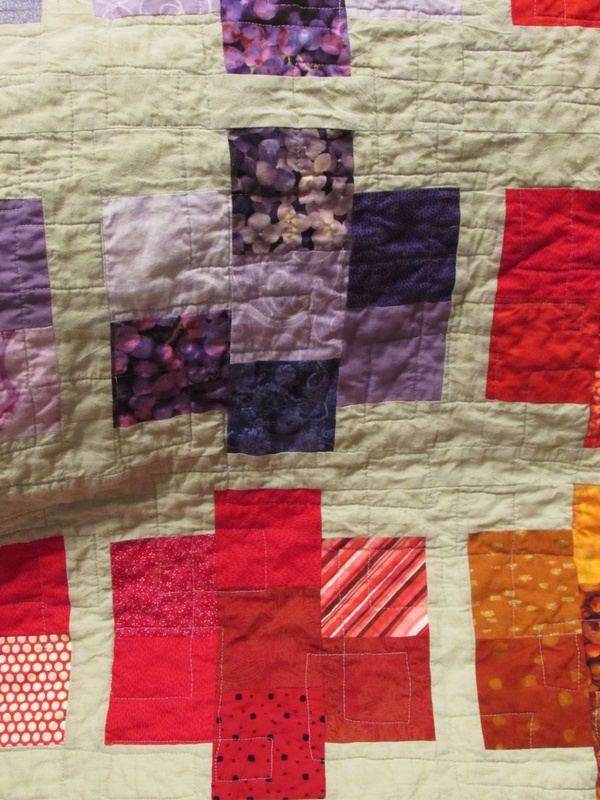 These blocks call out Topaz, or Tiger’s Eye, and what is better for a quilt called Gemstones? I will confess that I had to go buy a few fat quarters to be able to use this colorway. I only had a few in my stash. Aren’t they gorgeous though? 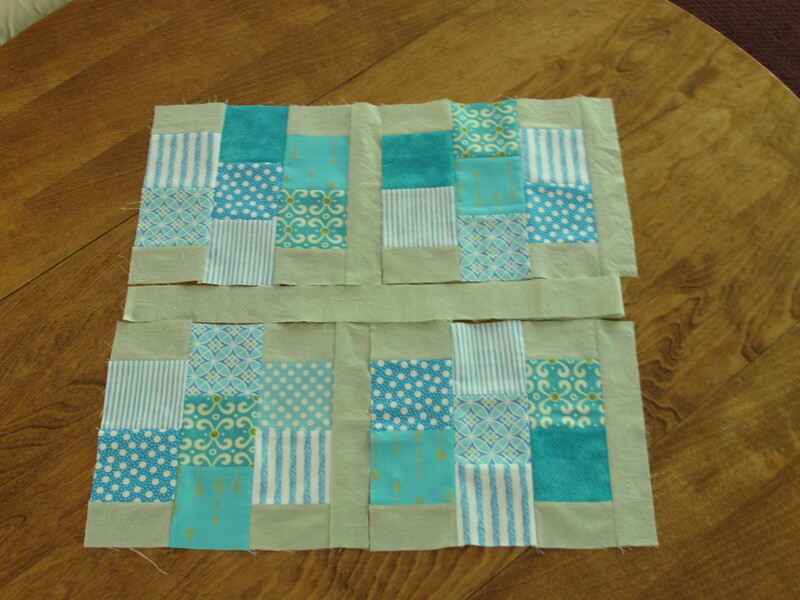 I added the green sashing strip to one side of each block so I could see what that framework would look like. It’s perfect! At this point, I have made blocks to represent Amethyst, Topaz, Sapphire, and Rose Quartz. 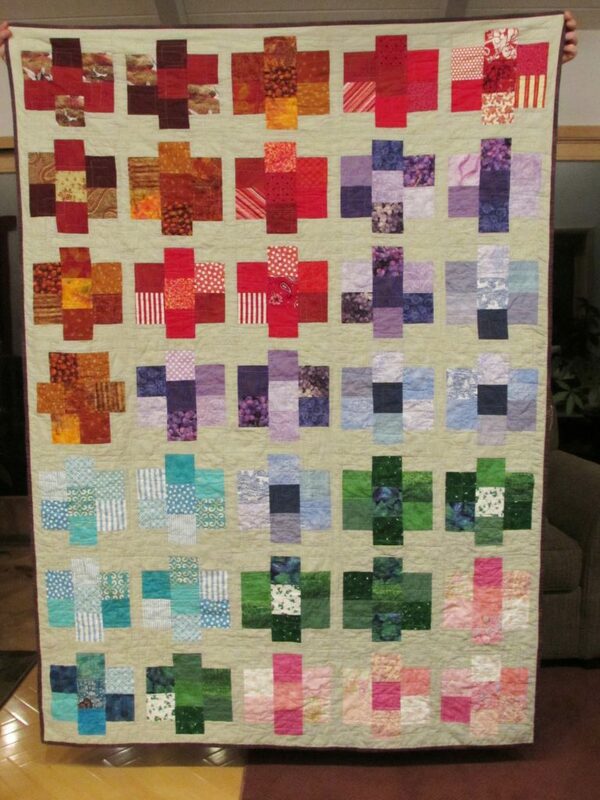 I still need to make blocks in Ruby Red and Emerald Green. What other gems need to be included? Maybe a lighter green for Peridot? Finally, I used the last of the orange patchwork squares to make a little hot pad. 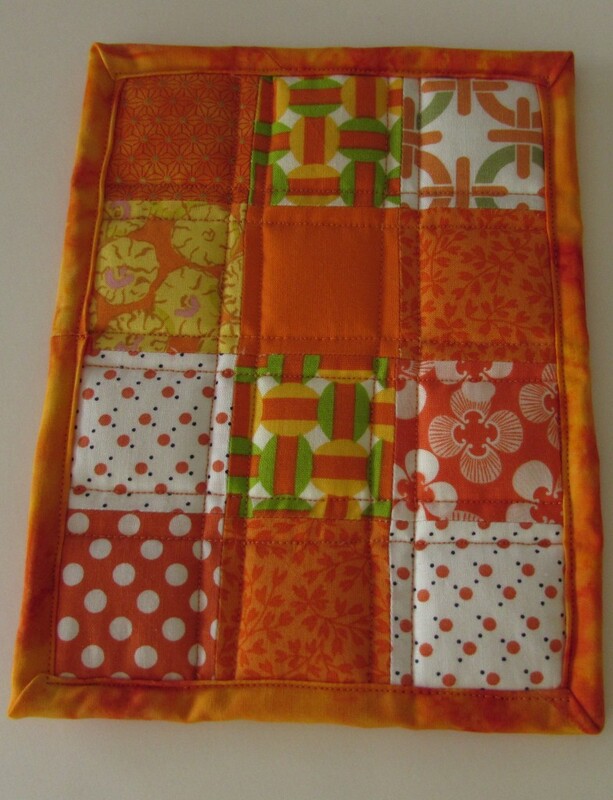 I will pop this in the mail to my sister who seems to have a thing for orange right now. I used two layers of Insul Bright for insulation which makes it a bit stiff to handle. I found it was challenging to bind. Or maybe I just didn’t pay close enough attention? I machine stitched it to the front and back and it only looks ok. Should be alright since this will end up in a kitchen drawer and not under anyone’s close inspection! 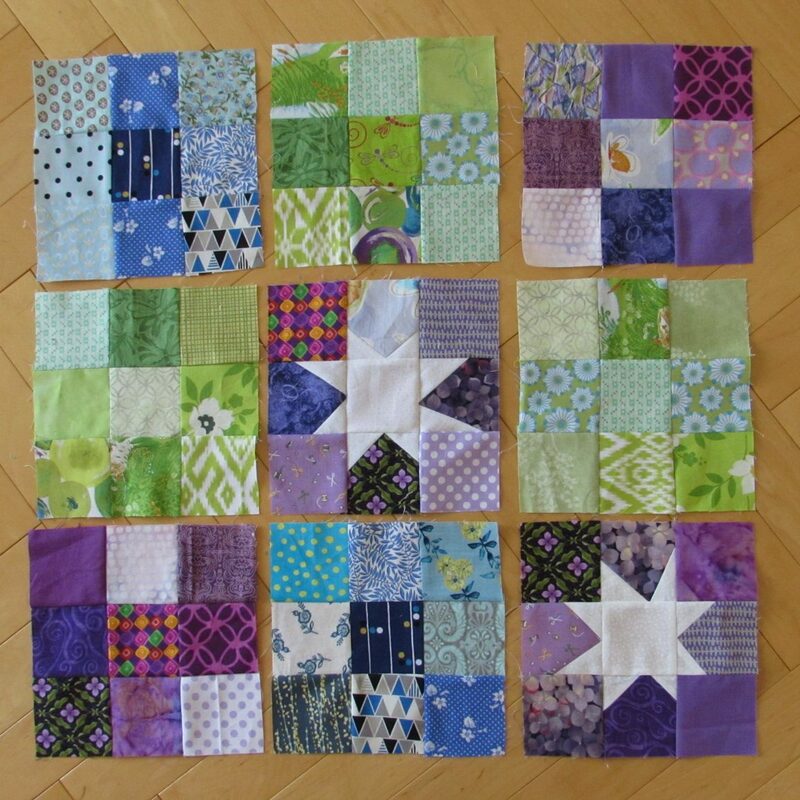 Scrappy projects for April are complete! 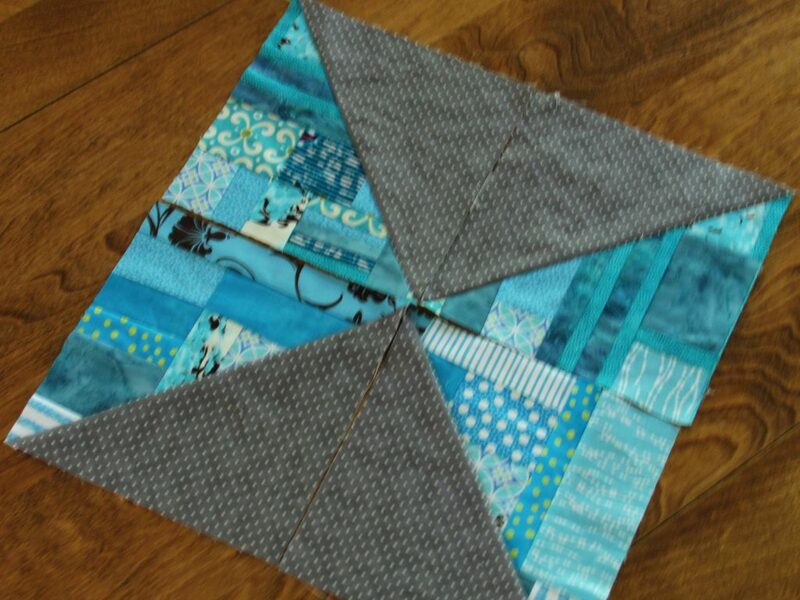 This week I will continue to work on the Stepping Stones QAL. I was very happy to see (on Instagram) that Sandra over at Musings of a Menopaulsal Melon (probably the best blog name out there) joined in. 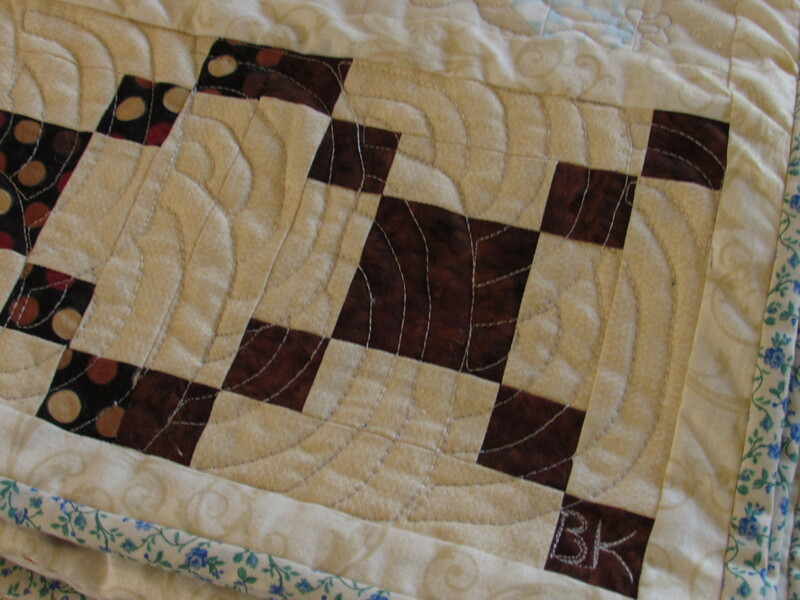 She is making a great quilt using a neutral palette. 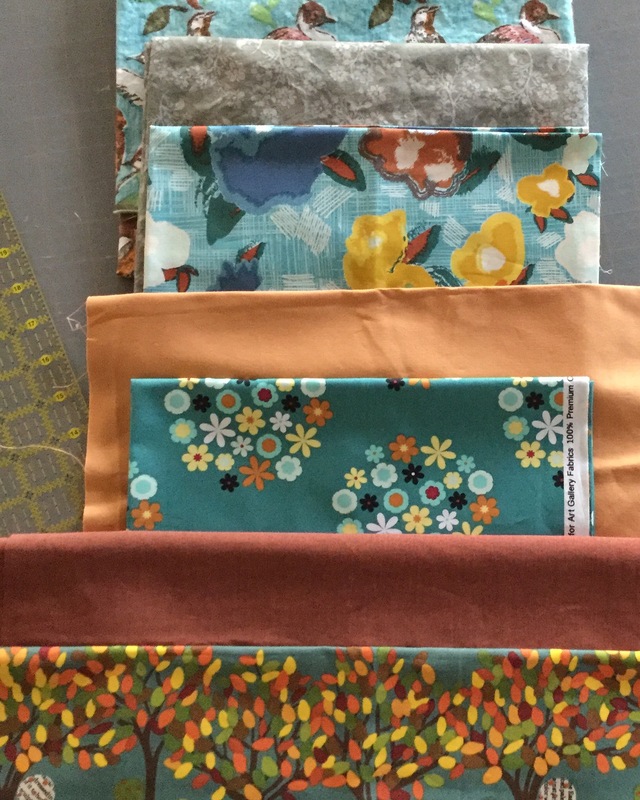 In addition, I am working on a mystery QAL over at The Inbox Jaunt. More on that later this week. Finally, I will be hosting Free Motion Mavericks for Muv this week. 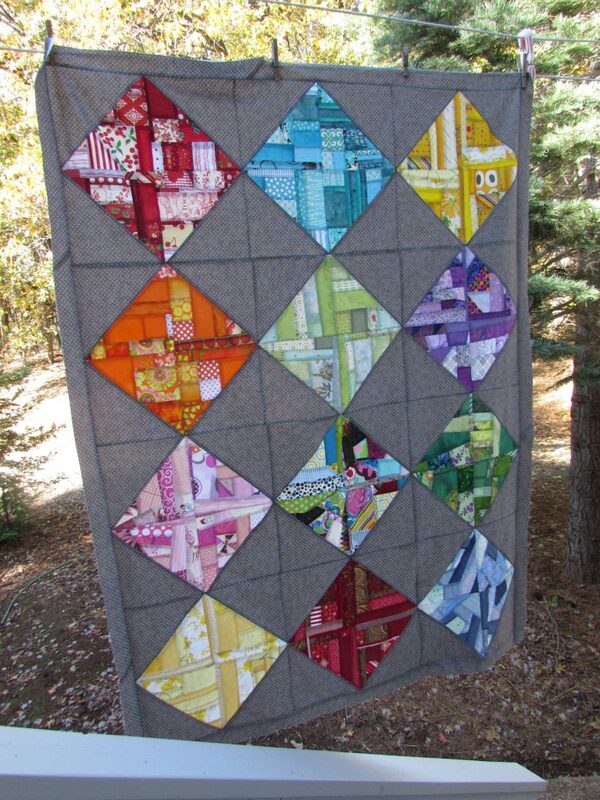 I hope you will come back on Thursday and link up your FMQ projects!! As always, I am linking this post up with all of my favorite spots. Check them out at the top of the page, under Link Ups. 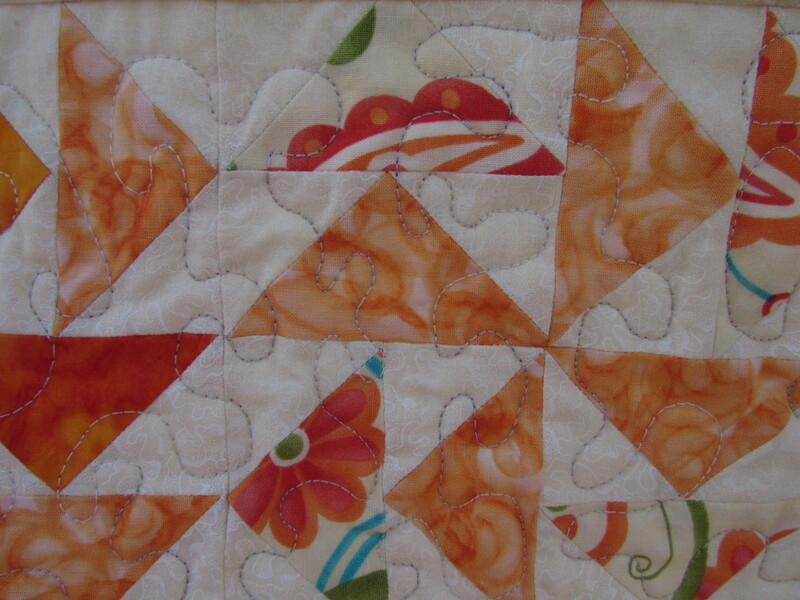 This entry was posted in RSC Challenge, Scrappy Quilting and tagged pretty gemstones, RSC16 on April 11, 2016 by Bernie. 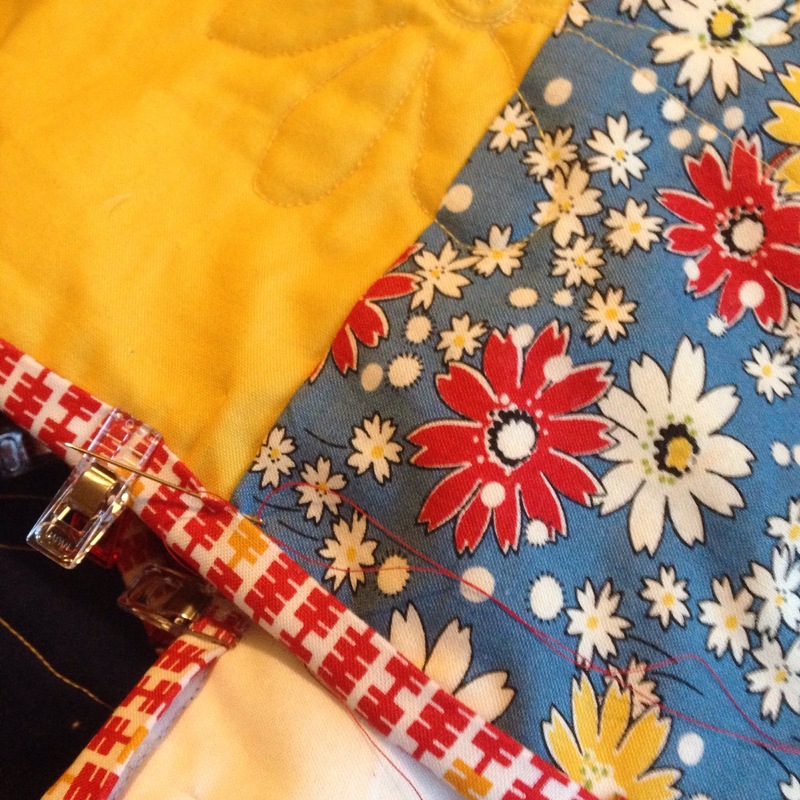 I have been hand stitching the binding on my Square Dance quilt. 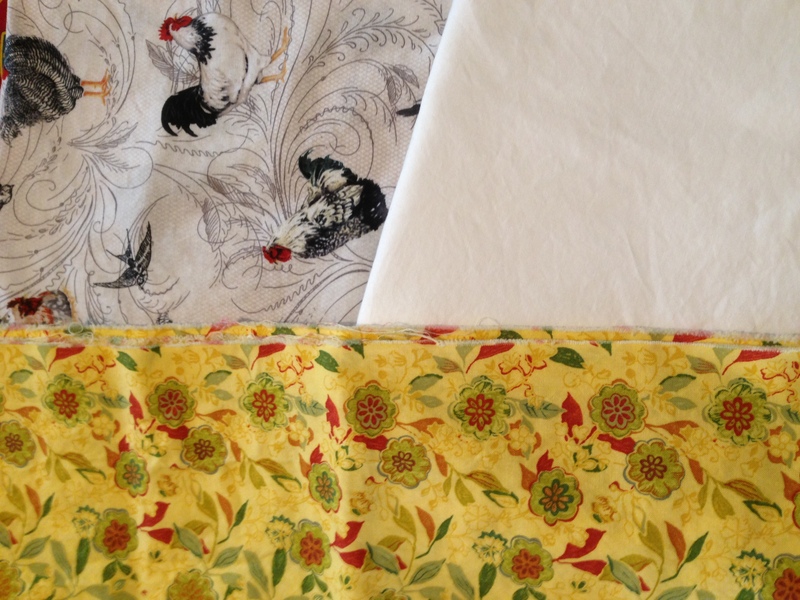 I found a cute red and yellow print on a sale table that works well with this pallette. Picking this up in the evenings and stitching a bit is perfect. 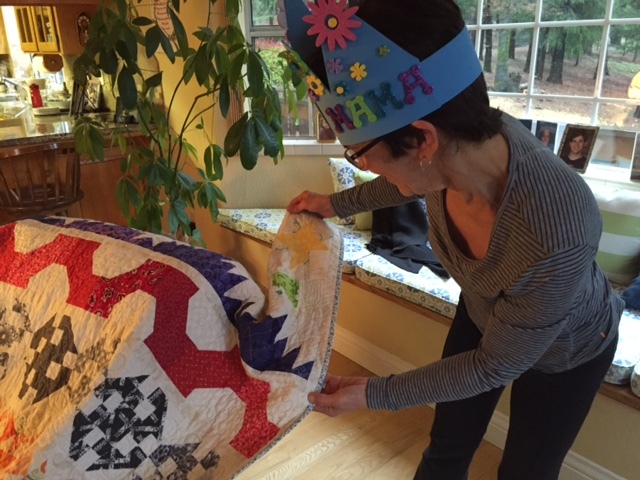 I brought it up to Downieville over the weekend for some hand sewing but only worked on it for a short while. I should have it finished up by the end of the week. 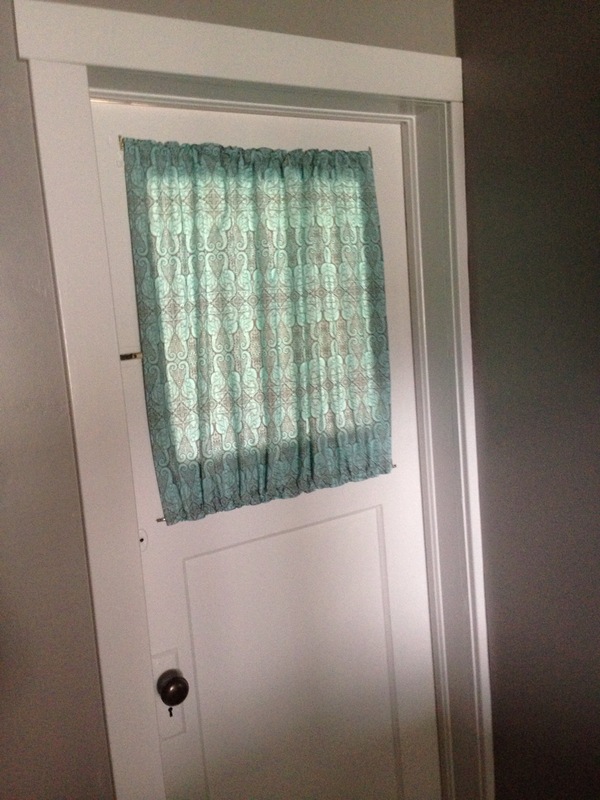 Knowing that we were going to be up at the house in DV, I made a little curtain. In our bedroom, there is a door leading to a tiny room which will someday be a sewing room. For now, it is where Ray keeps his tools and supplies for all of the work he is doing on the house. But someday…. it will be a perfect place to sew. This door has a window that I wanted to cover for privacy. The sewing room has windows that one can look through to the bedroom. I used a great piece of Tula Pink in gray and blue. I took the photo at a weird angle because the sun was coming through and when I took it straight on, the colors were way off. Now that April is here, there is a new color for RSC16, orange. 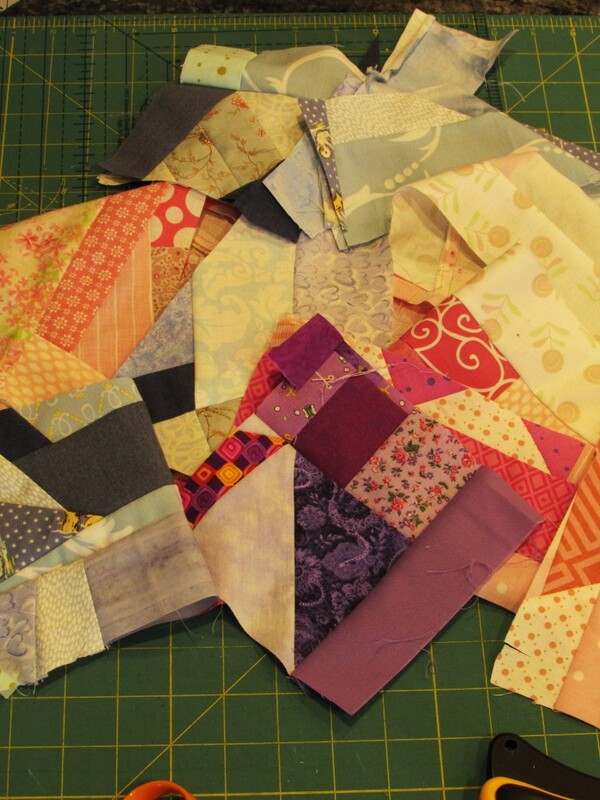 Not at all my favorite color, I was surprised to see how many scraps I had to work with. 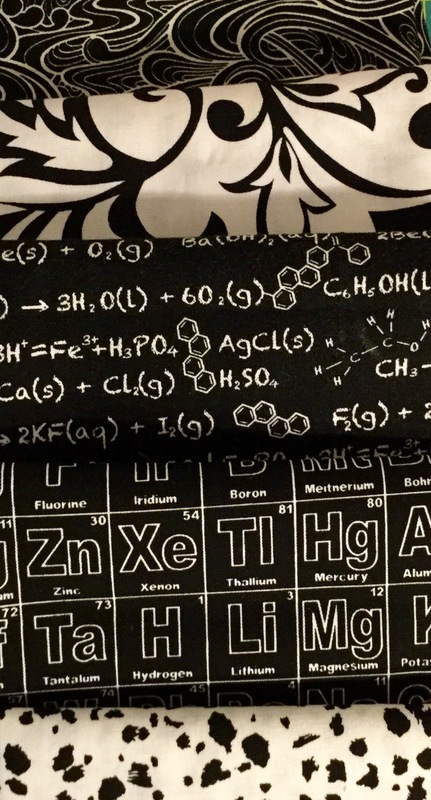 Last night I worked on “making” fabric (as discussed in “15 Minutes of Play” by Victoria Findlay Wolfe.) It is coming together well. I had a patchwork block left over from RSC14’s quilt so I unpicked some seams and used bits of patchwork for the new blocks. 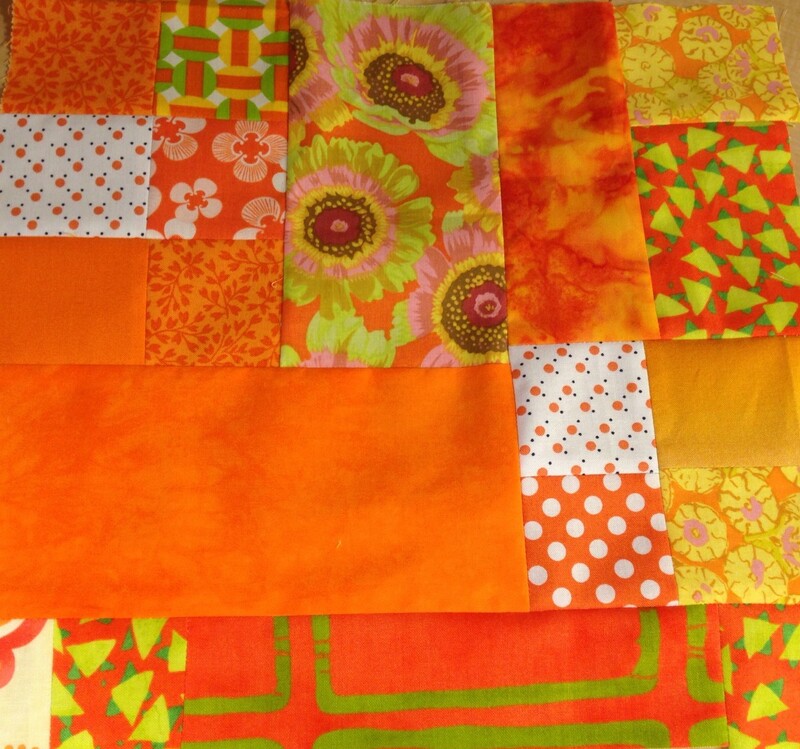 These colors will add a huge pop to my scrappy HST quilt. I won’t use them for the Gemstones quilt though. After a little back and forth with Cynthia Brunz, she suggested swapping out orange for a deeper rust (think of Topaz gems). 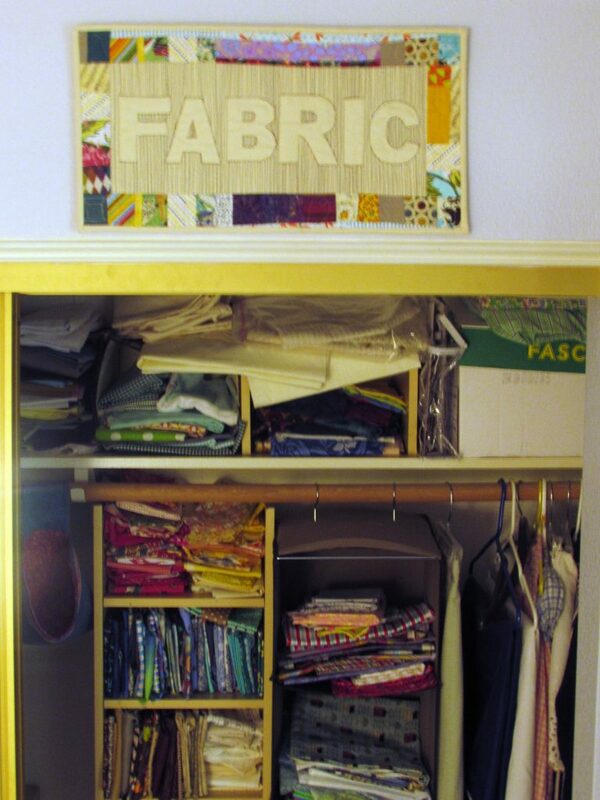 I love this idea but don’t have enough choices in my stash. 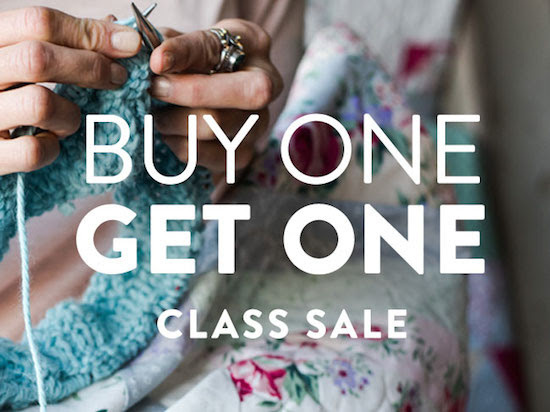 I will pick up a few FQ’s for this. 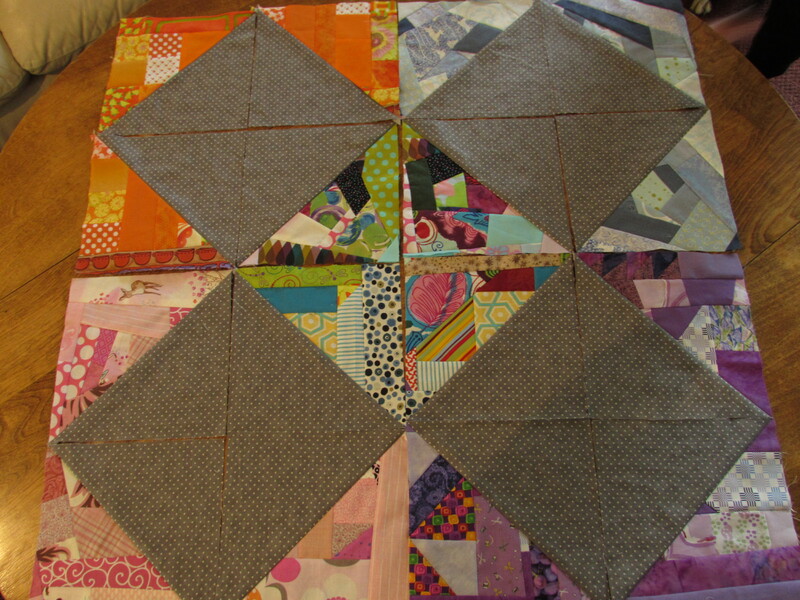 Finally, I made huge progress on the Stepping Stones QAL that I am doing with Jennifer over at Inquiring Quilter. 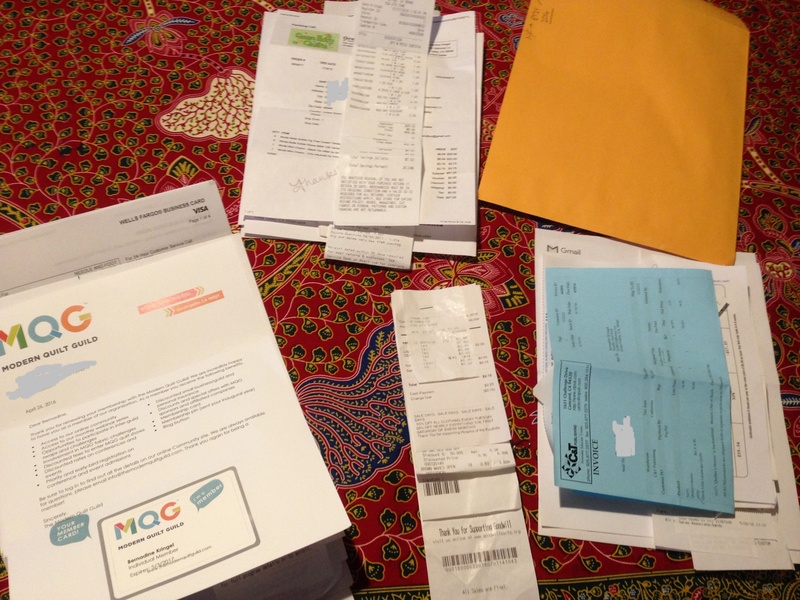 Participating in the QAL has been the perfect way to keep me on task. After many years of working to a deadline (which is so common in the HR world) I am finding that having the deadline is really helpful to me. I have pieced the 143 HST’s needed. I also cut some extra charms. After counting what I had, I came up slightly short. Take a look at these black and white FQ’s that I picked up to supplement my charm squares with. I love all of these! 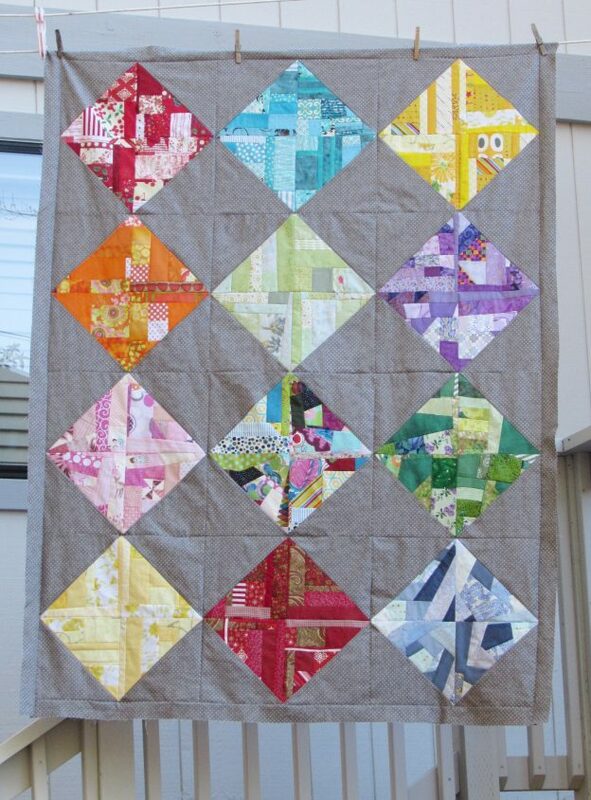 The fabric at the top is a Tula Pink which I found interesting – I don’t think she uses black and white very often. It is gorgeous though. 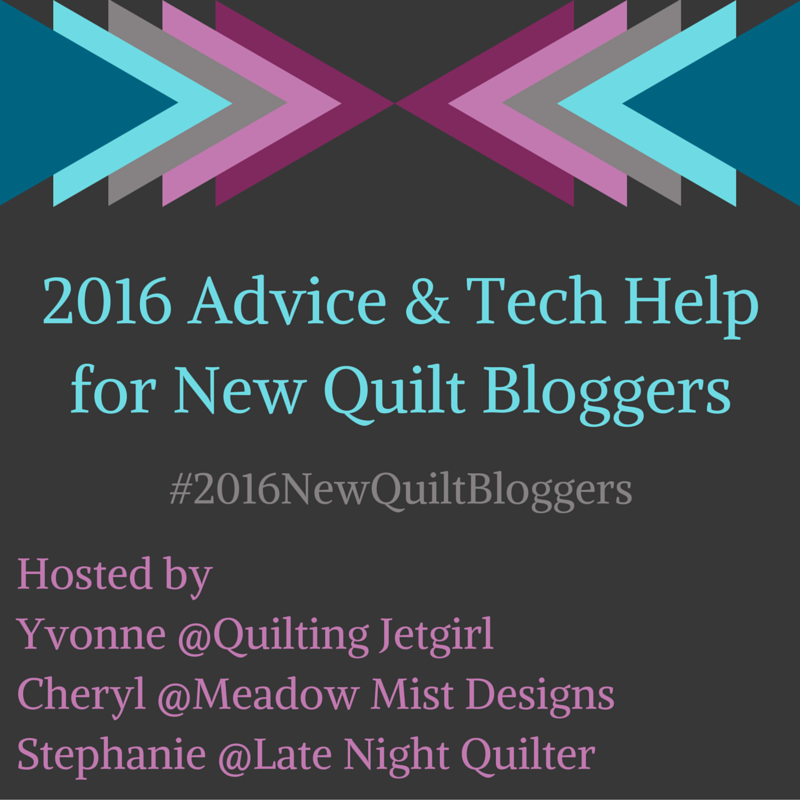 Finally, I want to let you know that signups are open for the 2016 New Quilt Blogger session with Quilting Jetgirl, Late Night Quilter and Meadow Mist Designs. I participated in this activity last year. 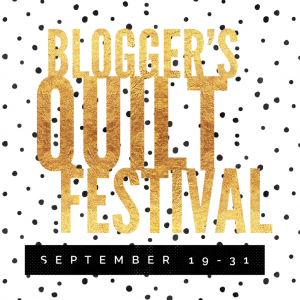 If you are relatively new to the quilt blogging world, I highly recommend participating. It was a valuable experience offering tips and techniques that taught me so much. Working with a large (we had about 70) group of bloggers, I became acquainted with many new bloggers. Opportunities were available which helped to push me to learn and grow (such as the block hops sponsored by Paint Brush Fabrics.) 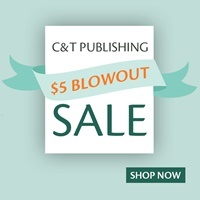 Be sure to check out the information at any of the three websites I have linked to and see what if this is right for you. If you have questions, leave them in the comments. Here are the criteria for participating in this event. 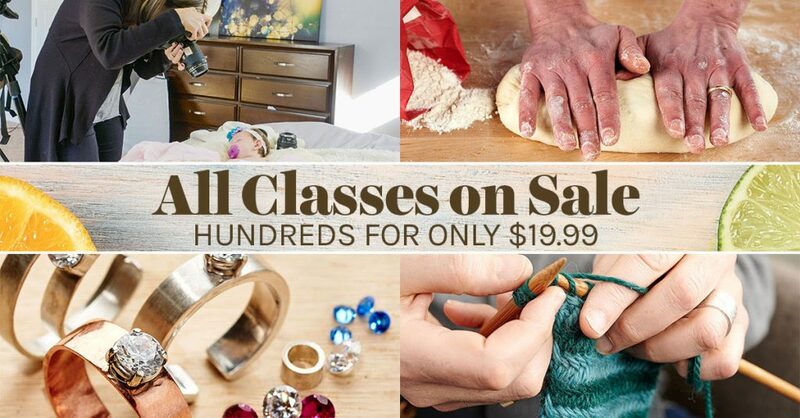 **If you are interested, sign up here! Hope you are all having a wonderful week. Springtime is certainly long in coming to the east coast but we are in full swing on the west. 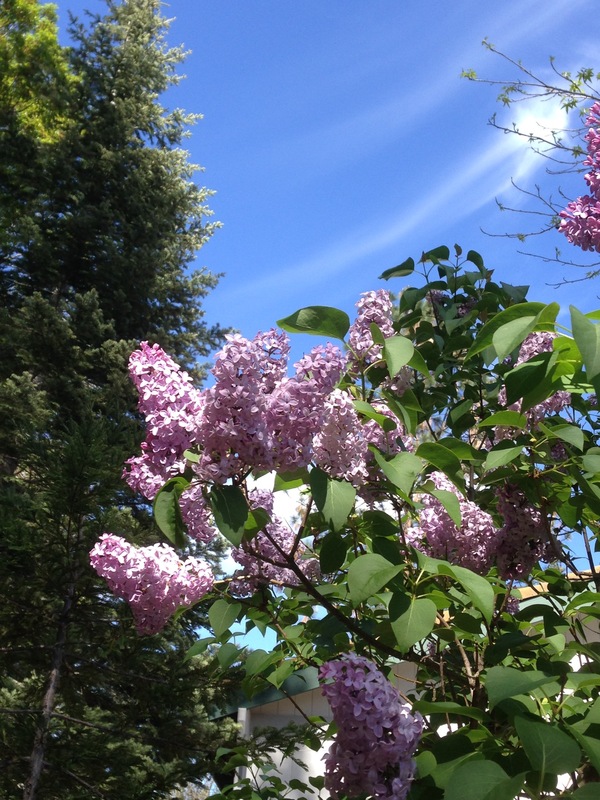 My lilacs are fully blooming. I tried to cut some for inside the house but the fragrance was powerful and I couldn’t leave them. We were all sneezing after just a short while! Linking to lots of fun places. Check out the links at the top of the page, under Link Ups. 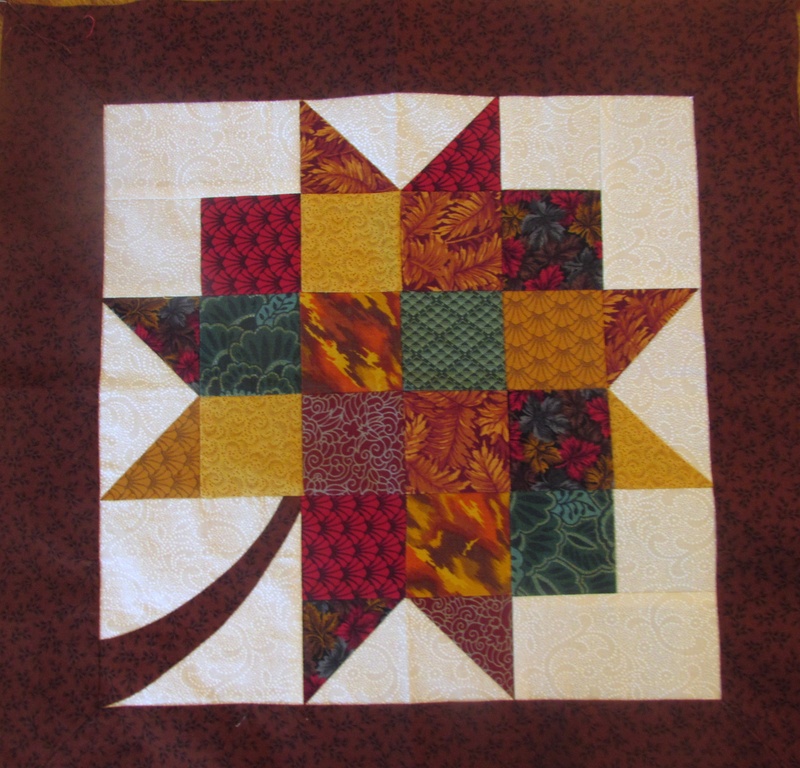 This entry was posted in RSC Challenge, Scrappy Quilting and tagged made fabric, RSC16, Stepping Stones QAL on April 5, 2016 by Bernie. 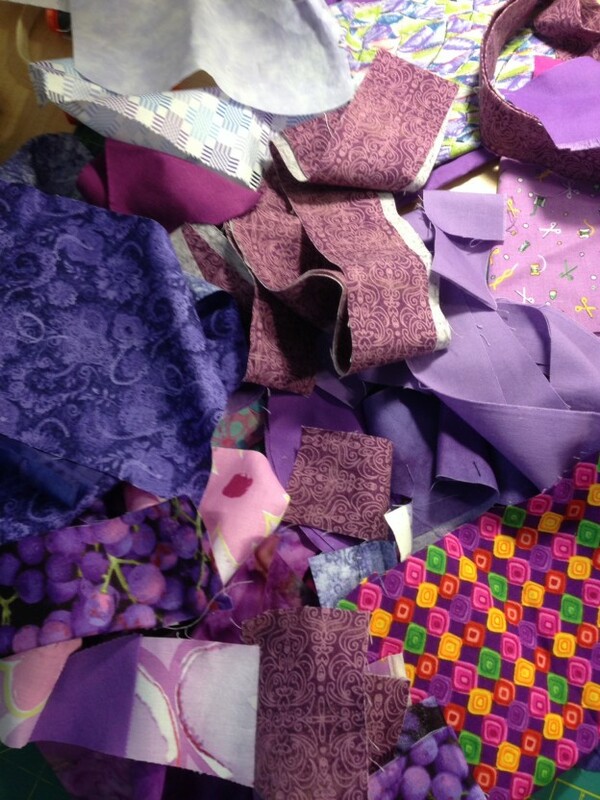 This week I discovered that I have almost no purple fabric; scrappy, yardage or otherwise. I don’t know why. The purple section on the shelf is nearly empty and my purple scrap bin is the same. I will soon have the pleasure of shopping for a few purple blenders to build things back up. But first, let me show you what I managed to cobble together for the RSC16 for the month of March. 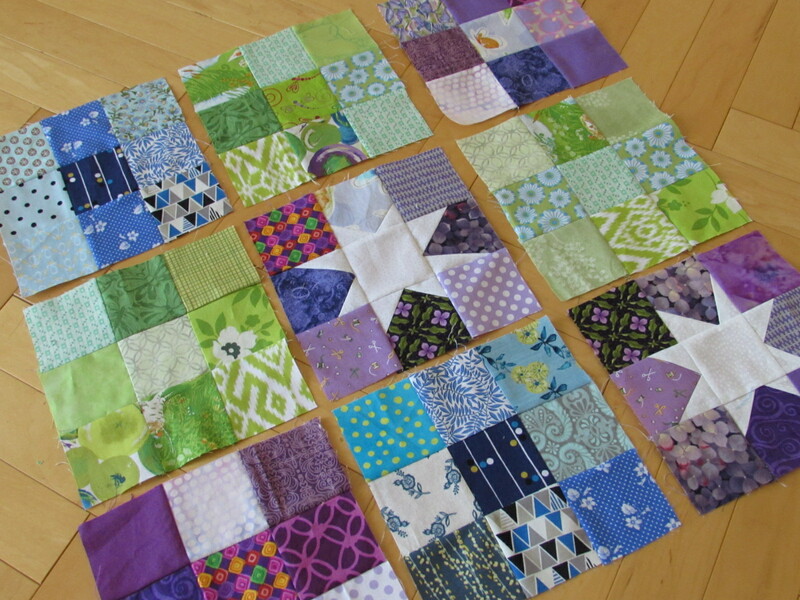 My blocks for the Gemstone quilt are starting to accumulate. Here are the newest additions in all their purple splendor. 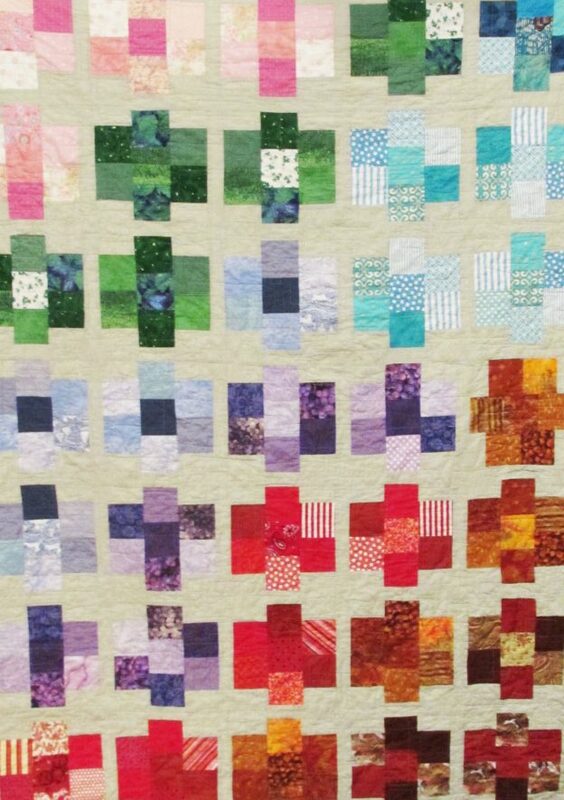 This quilt is going to be so pretty. The first three months look wonderful together. 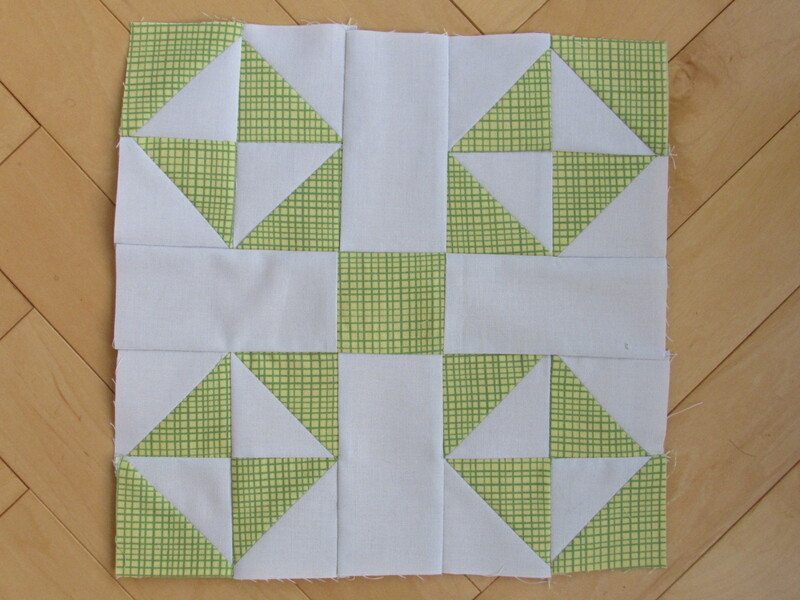 Remember that each block will be sashed in the pale green so they will be floating on the green background. 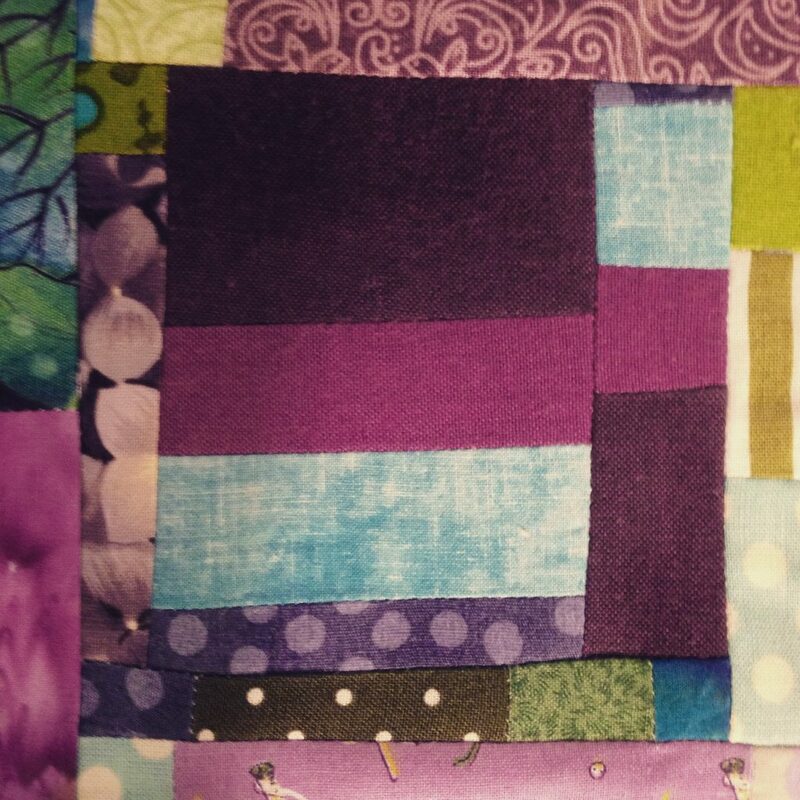 Because most of my purple scraps are strings of various widths, it was easier to work on my improv project. 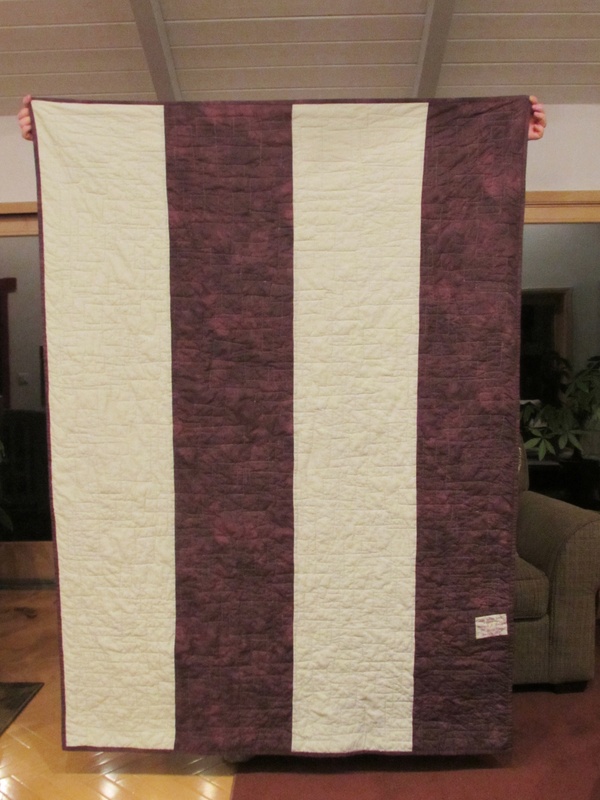 I made a slab of purple fabric using all sorts of tiny pieces. I am loving how these are coming together. 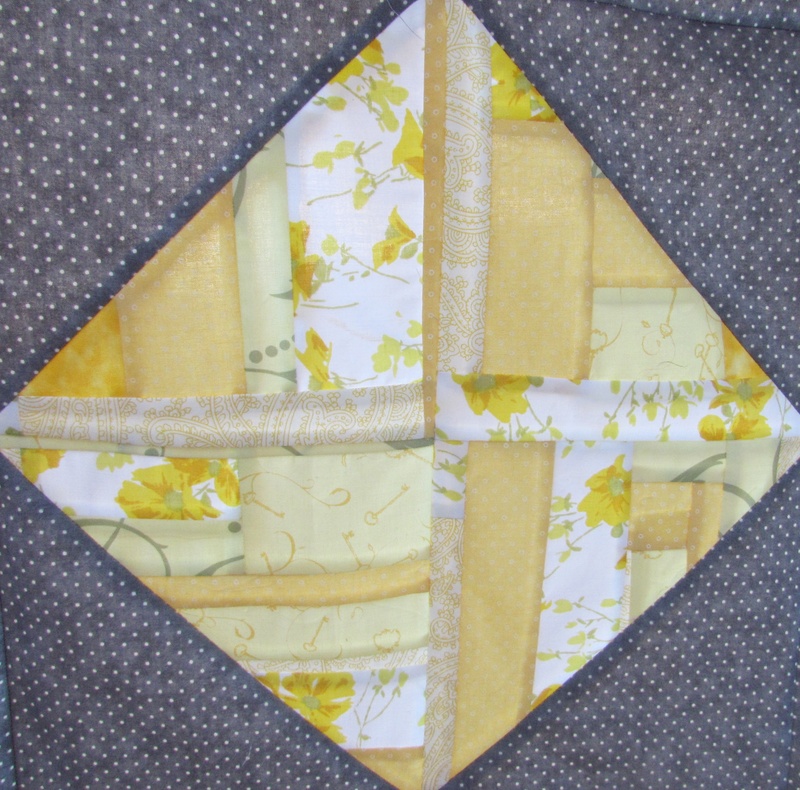 I was careful to preserve the parts of the made fabric that I wanted to show up in the HSTs. My little girl, the pink pinwheel, the tiny purple HST’s, and the little deer on the edge of the other pink HST. 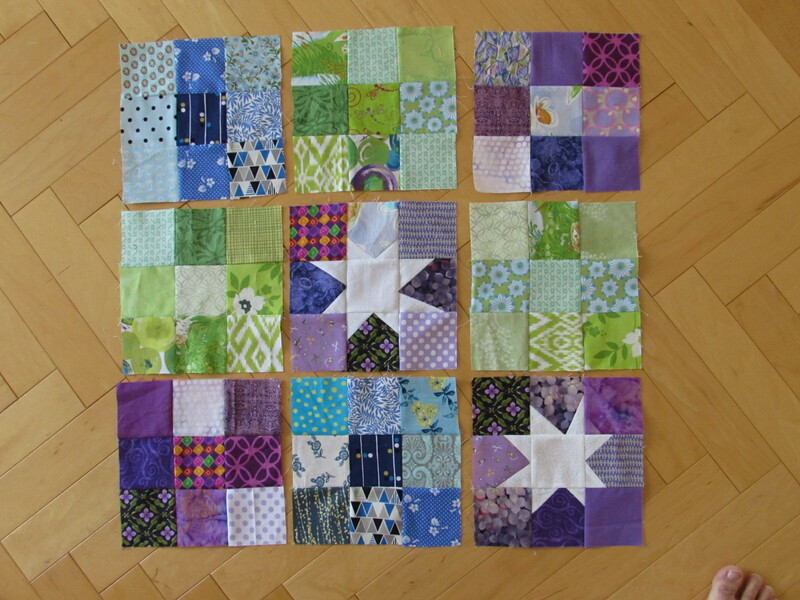 For now, I am going to aim for four or five blocks from each color, which will give me about 50-55 blocks. Then I can lay them out and see what it still needs. I have plenty of the gray dot fabric for the project. 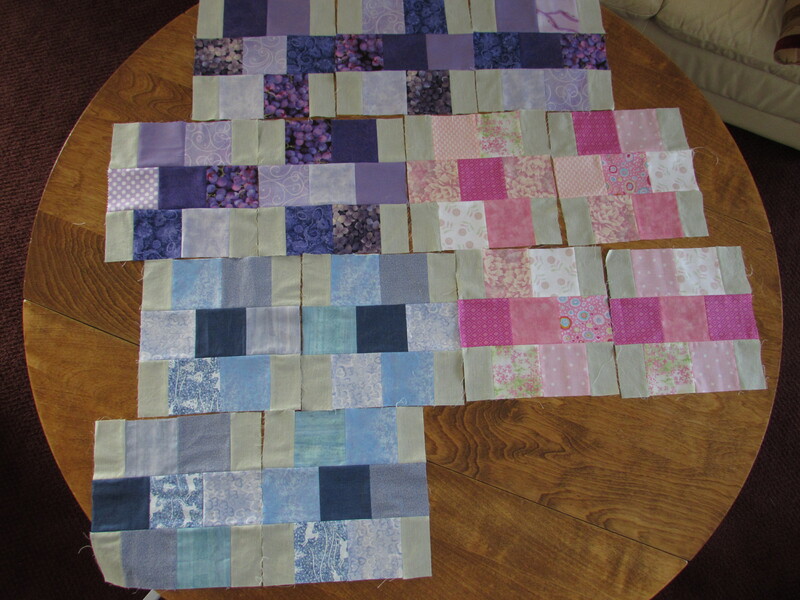 Cutting the made fabric slabs left me with a number of large scraps. 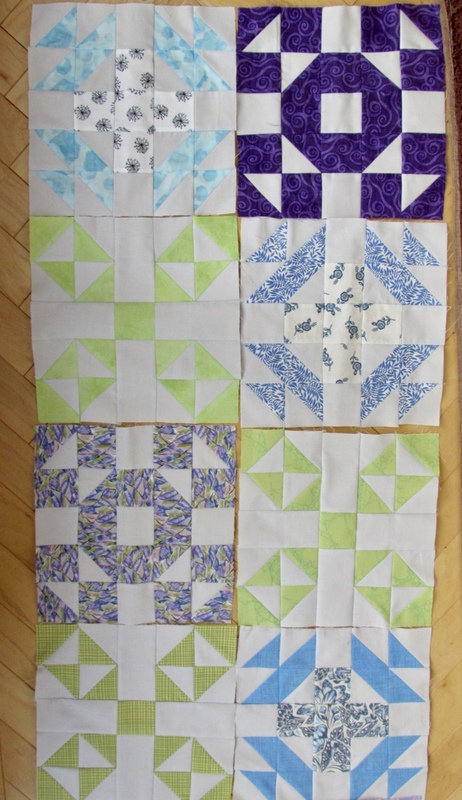 I will hold on to these and can stitch them back together as needed for extra blocks when I lay this out. 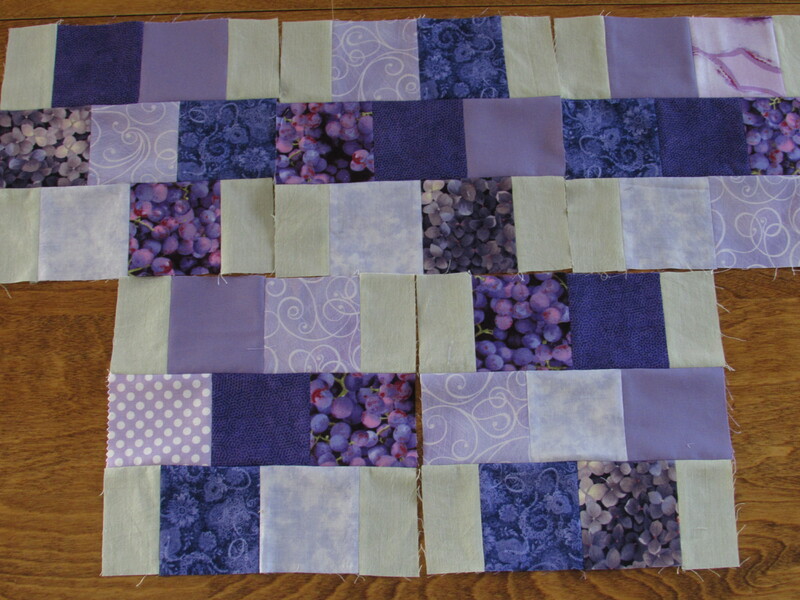 Linking up with my usuals, including Oh Scrap and So Scrappy and looking forward to seeing what everyone is doing with their purple scraps this month! 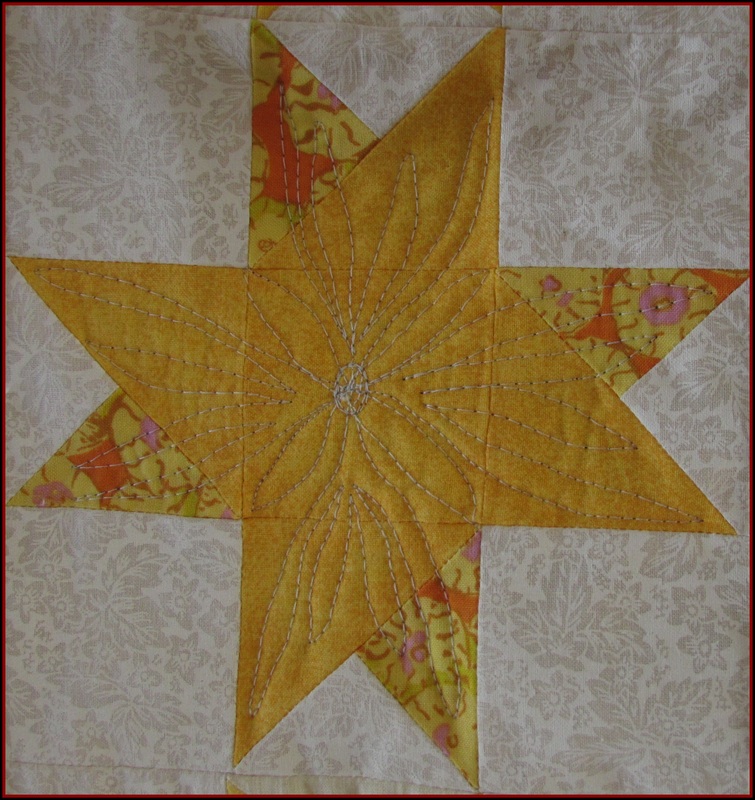 This entry was posted in RSC Challenge, Scrappy Quilting and tagged made fabric, pretty gemstones, RSC16 on March 14, 2016 by Bernie.